Installed carpet, one more project crossed off my long list. See the write up in this issue about how all that went. Already on to new things- recently purchased items that include; window glass seals and a complete urethane bushing set for the suspension. Urethane replaces the original Metalastik bushings as they are NLA. They will seem a bit stiffer than the originals, it should still be a good ride. Next in line for getting done: plumbing the brake system reinstalling the dashboard. The previous owner, in his zeal to restore had completely removed the dashboard, which I think was not even necessary. I need to do more searching and look for all the fasteners. I'm tired of looking for nuts and bolts and screws in paper bags. A thorough sorting may be coming up. I'm using the exciting Jensen Healey Carpet Kit suitable for all Jensen Healeys. It fits well and offers all the bits to get your interior looking better than new. Comes in a big box and provided me with hours of enjoyment. What you need- You only need a few items to do this job yourself, some good quality contact cement (see my cement alternative below) a few wide, cheap brushes for the cement, scissors, cutting knife and some patience. 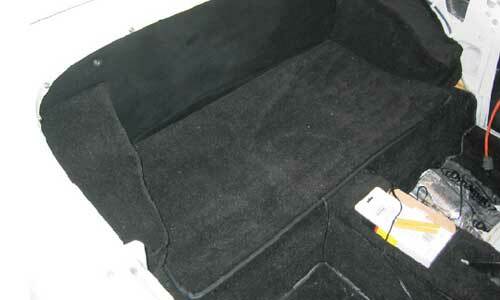 Remove your seats To complete this job properly you must start with an empty interior. Youll need to remove the seats, which is often a major task due to rusted bolts and support brackets. Sadly, the metal supporting the weight of the seat and occupant is only folded over sheet metal. No problem in itself, but once rust gets a grip, watch out! Its best to coordinate this job with any other needed repairs to the floor boards. Sometimes a fiber-glassing of the floorboards is all thats needed after prepping the metal with rust preservative. Other times only a full replacement is the answer. Also remove the console and chrome kick strips in the bottom of the door frame and of course, remove all old padding and carpet, rubber mat junk and any other weird, old bits laying around inside your car. Lay out all the carpet pieces so you can look at them and become familiar with where they go. Each piece is quite specific to location, right and left side, so match up pieces carefully before you start fooling around with the glue. Included is a road map of the pieces, but its still a little confusing when you are presented with all this for the first time. What glue to use? It also says in the directions to use a good quality contact cement (youll need at least 2 quarts). Thats key, because I ended up buying the environmentally friendly, low volatility formula (useless) contact cement that was all my local Home Despot store carried. Im not sure really what this stuff is, but contact cement it is not. After coating each piece four times and waiting 45 minutes between coats it was crystal clear to me that this rubbish would never work. Ive used real contact cement many times over the years and I was appalled at how poorly this product worked. The hours where passing by and I had nothing to show for my labors. In frustration, I rummaged through the trusty tool box and found- yes! The Hot Glue Gun with a full box oglue sticks! I heated that puppy up and in 10 minutes was attaching carpet to the car as fast as I could figure out where it goes. The bad thing about contact cement is the set up time. You need to brush on both sides and wait until its dry (at least 30minutes) or it doesnt work. The hot glue gun is ready to go, I loved using it since I had instant results. Squeeze on in four or five spots, hold together for 30 seconds, and its done! Working in small areas as I went allowed for perfect positioning. I still cant see any down side to using a hot glue gun, it worked for me and Id use it again in a second. It provides a fast, secure, waterproof bond and carpet can be removed without much damage if something didnt go on in just the right spot. First things first Make sure your interior is clean, vacuum if needed. The glue needs clean surfaces to adhere to. Be sure to test fit all pieces before you begin to glue. Again, the Delta kit comes with a basic guide and helps you figure out what goes where. Start with the front seat support pieces and cut out the seat mounting area with scissors. I glued the top with my glue gun, let that dry and then glued to front and back areas to contour the sheet metal that supports the front of the seat. Next is the drivers sill area and driver console side. The console gets padding first, then the carpet is glued to that. These pieces will overlap on the floor where the floor pieces will cover the seams. Thats pretty much how it all goes together, hold up for position, glue small sections at a time and move on to the next piece. Vacuum everything, install chrome kick strips, console & seats and then come over to my house and install the dashboard for me, and you're set!